Virbac Vitaminthe is a convenient, palatable broad spectrum paste for dogs and cats. Effective against roundworms, hookworms and tapeworms, The paste is suitable for use in dogs and cats of all ages. 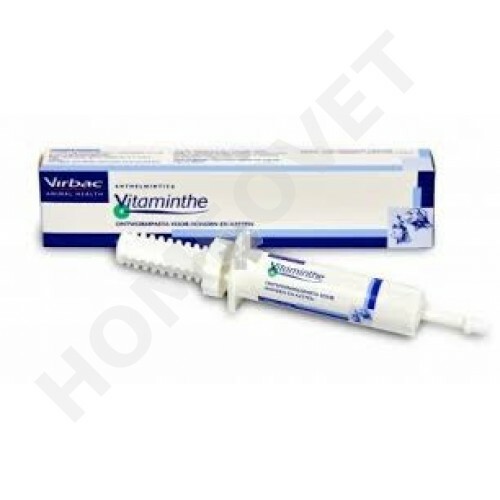 Vitaminthe is a broad spectrum anthelmintic paste for dogs and cats. Niclosamide is specifically effective against tapeworms and oxybendazol combats both adult and larval stages of roundworms, whipworms and hookworms. The combination of both active ingredients in the paste makes Vitaminthe suitable for use in dogs and cats of all ages, and it can also be administered without danger to animals that are lactating. Tapeworms (Dipylidium caninum) can be transmitted by fleas. Re-infestation is prevented by effective flea control. Syringe with 25 ml (1 syringe division =5 ml). 1 ml per 2 kg body weight (15 mg and 120 mg niclosamide oxibendazole / kg).